The city is not wasting any time spreading the word on its annual MulchFest... Steven spotted signs up today at the Ninth Street/Avenue A entrance to Tompkins Square Park. 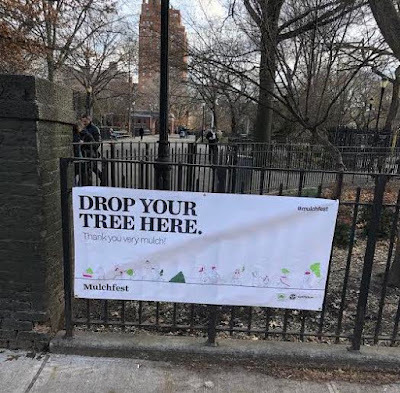 People can start bidding their trees fir-well* and dropping them off on Jan. 4 for the two-day MulchFest that will take place in Tompkins Square Park on Jan. 12-13. Anyway, don't feel compelled to get rid of your tree at the city's urging. There's another 11 months or so left to enjoy their company. 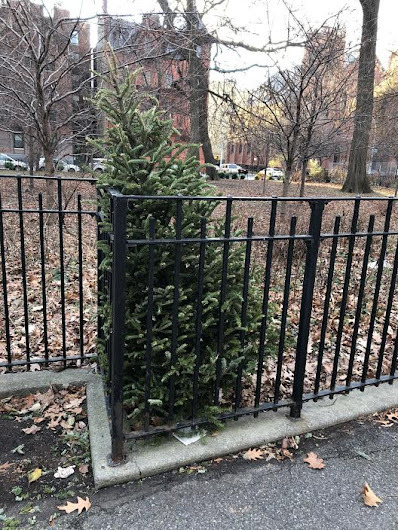 * the fir-well line is courtesy of the Parks Dept. I didn't even bother to decorate my tree. I walked it over to MulchFest immediately after purchasing it.